What is the world’s deadliest cat? The tiger or lion? Perhaps a leopard? Think smaller. Believe it or not, the deadliest cat on Earth is also one of the most diminutive—the black-footed cat. It earns this title by having the highest hunting success rate of all the cat species, catching prey about 60% of the time. 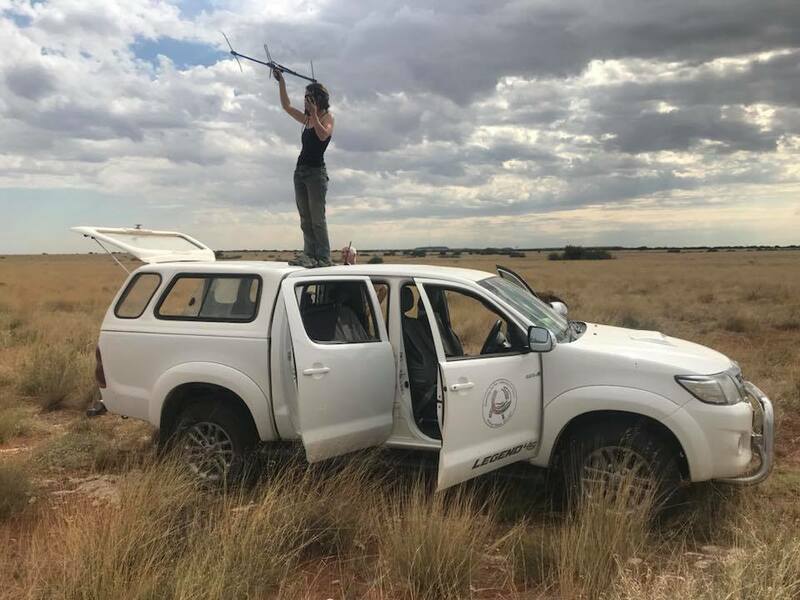 Each year, the Black-Footed Cat Working Group (BFCWG) spends two weeks working at our study sites in Kimberley and De Aar, South Africa. During this time, old radio collars are removed and replaced with new collars with fresh batteries on cats that were collared during previous years. In addition, the team goes out every night looking for “new” cats to capture and fit with collars. 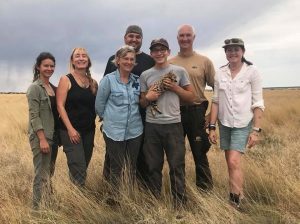 In November 2017, members of the BFCWG (Alex Sliwa, Beryl Wilson, Martina Kuster, Birgit Eggers, and Jason Herrick) were joined by Julian Kusak of the Wüppertal Zoo and Barb Palmer, Black-Footed Cat Species Survival Plan Coordinator from the Denver Zoo. 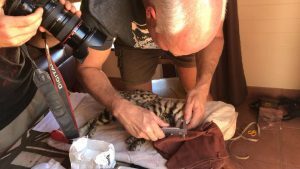 In just 10 days, 11 cats were captured, making 2017 one of the most successful trips for our group to date. Four of the cats captured in 2017 were new cats for us, meaning they had not been captured before, so they were fitted with their first collars. The other seven cats already had collars, which we replaced. As you can imagine, studying a three-pound nocturnal cat is not easy. 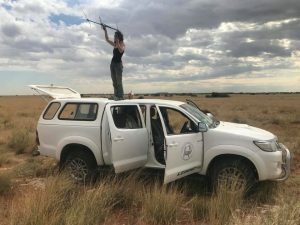 These collars will allow one of the team’s field biologists, Martina Kusters, to monitor the cats throughout 2018, expanding our understanding of the behavior and biology of the black-footed cat. 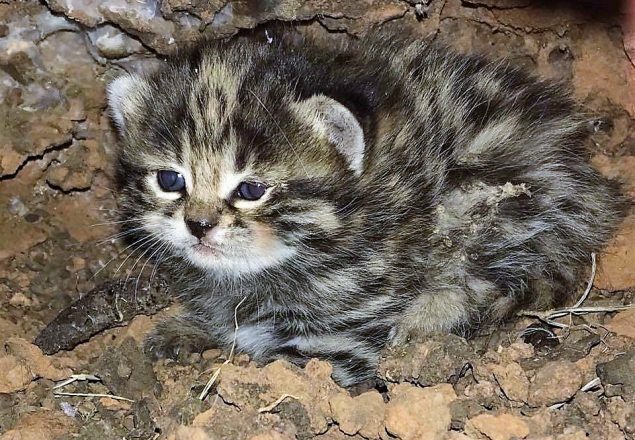 In addition to the valuable scientific information, monitoring collared cats also enabled a camera crew from the BBC to film black-footed cats for a documentary on small cats. 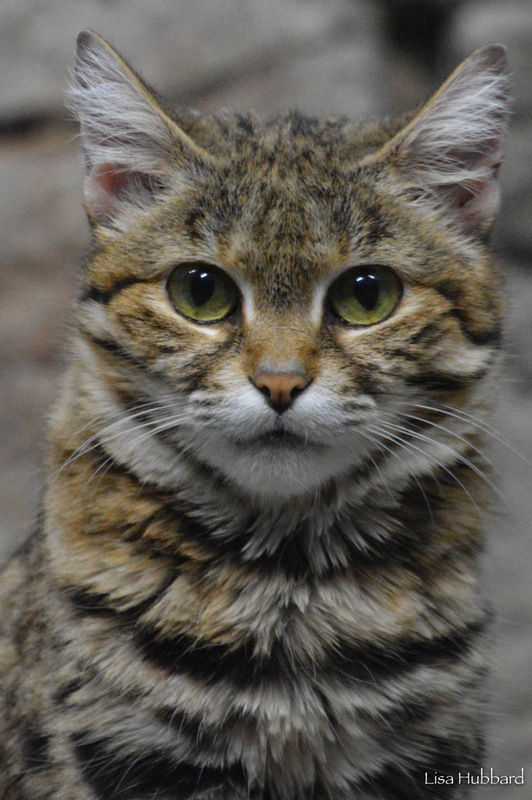 As a result, one of “our” black-footed cats, Gyra, and her kittens made their television debut in January. Hopefully, Gyra’s newfound celebrity status will make more people aware of this amazing species. 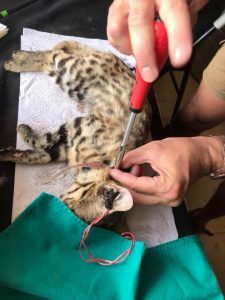 When the cats are anesthetized to place or replace their collars, the BFCWG also collects biological data. The cats are weighed and measured, their teeth are inspected, and a blood sample is taken. 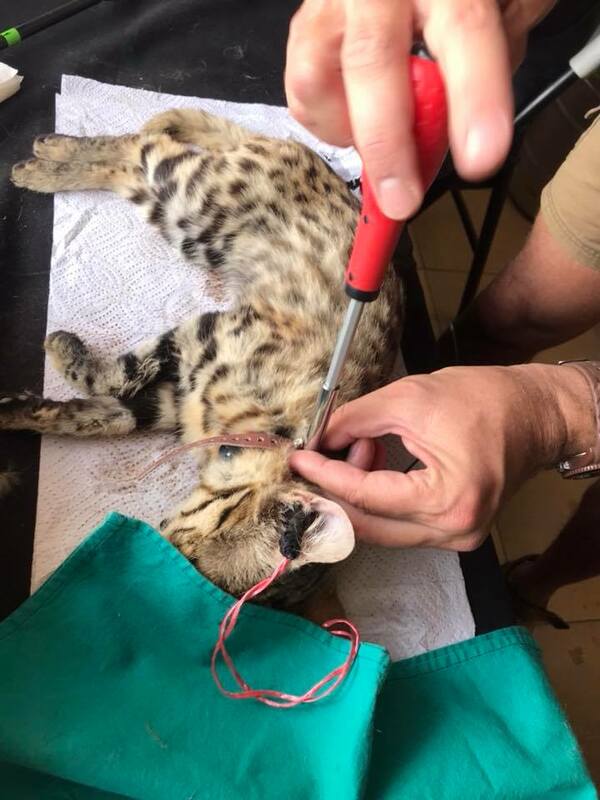 The blood samples allow us to monitor the cat’s health, including the prevalence of viral diseases and kidney function. 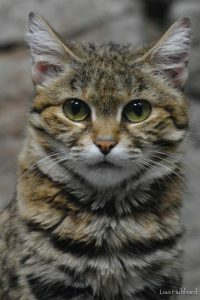 Kidney function is especially important since black-footed cats are highly susceptible to renal amyloidosis, which causes kidney failure and death in this species. 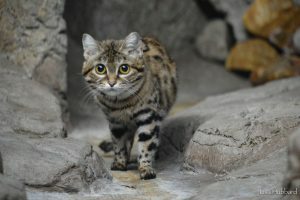 Male black-footed cats are also part of a unique study of reproductive biology in conjunction with the Zoo’s Center for Conservation and Research of Endangered Wildlife (CREW). Jason Herrick, current Director of Reproductive Sciences at Omaha’s Henry Doorly Zoo and Aquarium, member of the BFCWG, and former CREW post-doctoral fellow, collects and freezes sperm from the male cats. Excellent samples were collected from all six of the adult males captured in 2017, which are currently in storage in liquid nitrogen tanks in South Africa. In the spring of 2018, we hope to import these samples into the United States. 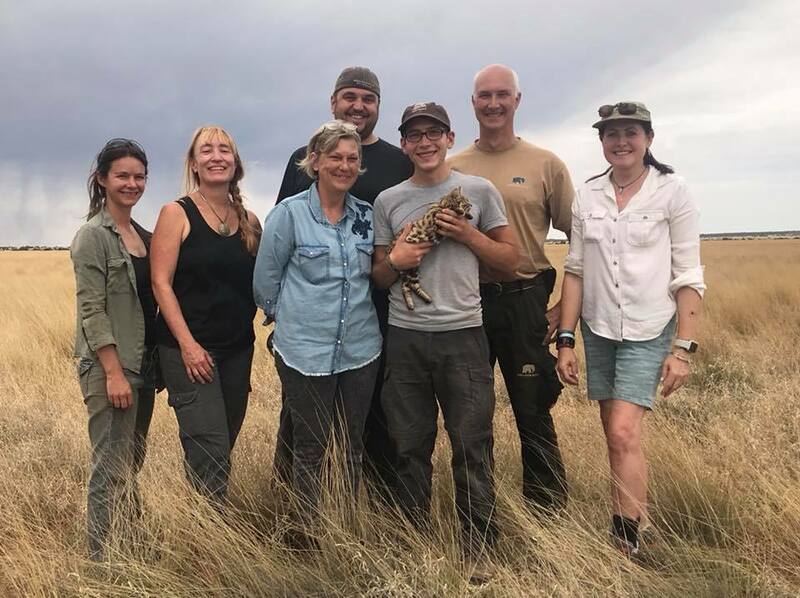 Together with Dr. Bill Swanson and Dr. Lindsey Vansandt of CREW, the plan is to use these samples to artificially inseminate female black-footed cats in zoos. 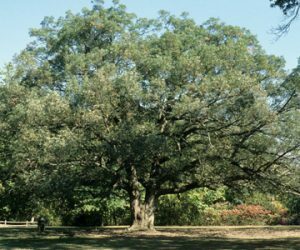 The resulting kittens will carry genes from the wild males in South Africa, which are extremely important for the long-term viability of the population in U.S. zoos. 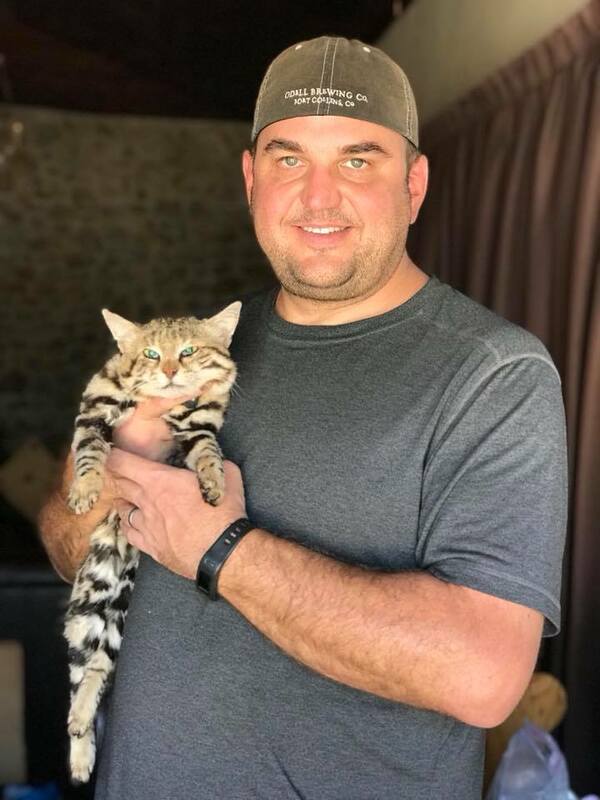 Importantly, the male’s genes are represented in the zoo population, but the male himself stays in South Africa to keep producing kittens the old-fashioned way with wild females. Next time you’re at the Zoo, be sure to visit our own two black-footed cats, Zola and Nadine, in Night Hunters. 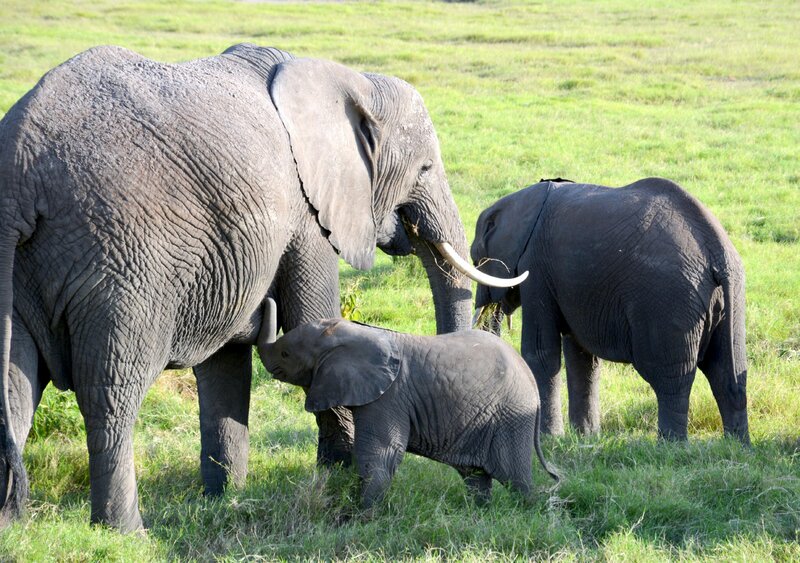 Sure, they might seem less dangerous than a leopard or a jaguar, but not to a gerbil or a small bird! Be A Bonobo Valentine as the Cincinnati Zoo Celebrates World Bonobo Day on February 14! 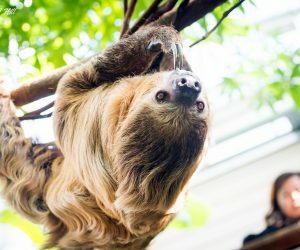 Celebrate International Polar Bear Day at the Zoo! Such a beautiful, compact cat with an adorable round face. So reassuring to know our Zoo is on top of studies such as the Black Footed feline of Africa. I hope you will be able to continue your good work! yes, the cat is very beautiful. What an adorable endangered cutie pie. Yet, I would not want to be its prey! They are sooo cute. Tell me more please. I don’t want to be eatennnnnnnnnnnnnnnnnnnnnnnnnnnnnnnnnn!!!!!!!!!!!!!!!!!!!!!!!!!!!!!!!!!!!!!!!!!!!!!!!!!!!!!!!!!!!!!!!!!!!!!!!!!!!!!!!!!!!!!!!!!!!!!!!!!!!!!! !